All the products we deliver are freshly made for you. Extract of maitake containing MD-fraction only. For maintenance of good health, take about 15–30 drops per day with water. Keep in a cool, dry place, away from high humidity and heat. Refrigerate after opening. Tablets composition: MX-fraction-rich maitake powder and MD-fraction. 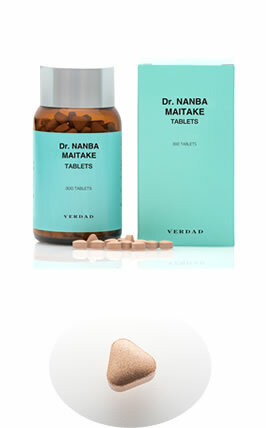 For maintenance of good health, take about 8-12 tablets per day with water. Keep away from direct sunlight, high humidity, and heat. Check the ingredients before consuming. If you have food allergies, do not consume this product. If you do not feel well after consuming this product, stop taking it. If you are on medication or regularly see a doctor, consult your doctor before consuming it. Start consuming this product prior to the best before date printed on the package. Tighten the lid firmly after opening. It is important to maintain good health on a regular basis so that one does not suffer from serious diseases. 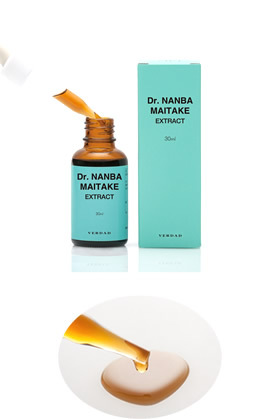 These products are consumed with expectations for the effectiveness of maitake, especially for the maintenance of health and improvement of medical problems. Because the substance extracted in "MD-fraction" cannot be efficiently absorbed from raw maitake mushrooms, consumers choose these health food products for efficient intake. Maitake is a type of mushroom from the Polyporaceae family, which often grows deep in the mountains of Japan´s Tohoku region. People have called maitake the "miracle mushroom" and "mushroom of eternal youth and longevity" since early times, and it was highly valued due to its rarity and limited availability in certain areas of the Tohoku region. However, since around 1986, it has become widely available in the market as a result of artificial cultivation*. Today, maitake is one of the most commonly consumed mushrooms in Japan. 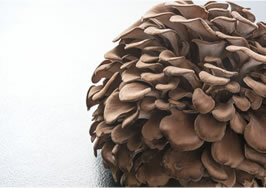 Maitake´s nutritional content is similar to that of vegetables. Over 90% of maitake comprises water, with the rest consisting of proteins, fat, carbohydrates (polysaccharide), vitamins, and minerals such as potassium, phosphorus, and iron. It is a highly nutritional food, and these nutrients are effective for recovery from physical exhaustion and prevention of lifestyle-related diseases such as high blood pressure, hyperlipemia, and arteriosclerosis. Its high fiber content also helps with intestinal peristalsis and eases constipation. High-quality maitake is produced through artificial cultivation in Japan´s Niigata prefecture in a well-maintained environment under vigorous quality control. * It is important that artificially produced maitake is used for research. This is because it is critical to obtain repeated samples under the same conditions in order to collect accurate and reliable data. Many mushrooms are known for their medicinal effects such as immune enhancement. This effect is provided by the carbohydrates (polysaccharide) present in mushrooms. Polysaccharide is a long-chain carbohydrate made up of smaller carbohydrates, and maitake contains a high amount of polysaccharides. What is "MX-fraction," the Maitake Extract? Similar to MD-fraction, MX-fraction is a particular polysaccharide of maitake discovered by Professor Nanba. It was announced in 1999 that this extract is effective for the treatment of lifestyle-related diseases of the blood vascular system, and its benefits include prevention of high blood pressure, improvement of diabetes, and prevention of hyperlipemia. 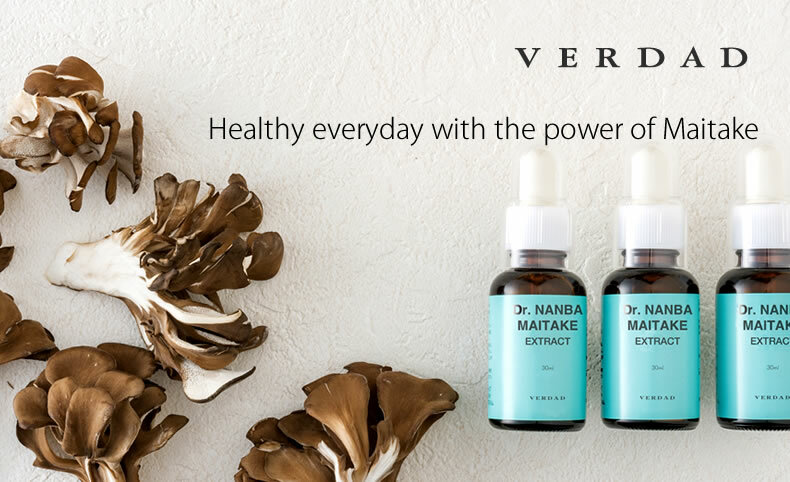 What is "MD-fraction," the Maitake Extract? MD-Fraction was discovered during a research conducted by Emeritus Professor Nanba of Kobe Pharmaceutical University in 1985. A total of 36 types of domestic and foreign mushrooms were examined for the potential anticancer effects of their polysaccharide, and maitake showed the strongest effect. The polysaccharide of maitake was refined into several fractions named A, B, C, and D, in order of their extraction. The last obtained "D-Fraction" showed powerful antitumor properties. This extraction was named "MD-fraction," with the M standing for maitake. This MD-fraction has a special molecular structure that is not found in other types of mushrooms and is considered to demonstrate stronger immune effects than other mushrooms.Some potential health benefits of MD-fraction related to the immune system include inhibition of cancer growth and metastasis, disease prevention and maintenance of good health. Dr. Hiroaki Nanba (Emeritus Professor, Kobe Pharmaceutical University, visiting professor of Kagoshima University Graduate School) discovered that the polysaccharide in maitake inhibits growth of cancer cells by activating immune cells. He named this substance MD-fraction and named another substance MX-fraction, which is effective for improvement in lifestyle-related diseases. Results obtained from the elucidation of these substances´ structures and their working mechanisms have been featured in specialized scientific journals and have gained worldwide attention after being presented at academic conferences and invited lectures not only in Japan but also in the US, Germany, Italy, South Korea, and China. A phase II clinical trial for MD-fraction was conducted in Sloan-Kettering Cancer Center with financial support from the US government, and its effectiveness was verified. This achievement was presented at the American Society for Clinical Oncology, and these results have been published in a cancer-specific scientific journal. For these research achievements, Dr. Nanba received an award from the American Cancer Society of Complementary Medicine and became the first recipient of the Pauling Grand Prix from the Memorial Foundation of Professor Linus Pauling, who was awarded a Nobel Prize in two fields. Dr. Nanba was later appointed as the Honorary Director of this foundation. "I have been engaged in laboratory research on maitake for a long time. As a result, I discovered a highly distinguishing polysaccharide in maitake that is not found in other kinds of mushrooms; I named it MD-fraction. This product, MAITAKE MD-FRACTION(Extract), MAITAKE MX-FRACTION(Tablets) contains the polysaccharide discovered in the laboratory, and its effectiveness can be expected." We will reply the credit card payment URL. After checking the order contents, if there is no discrepancy, please proceed to fill in your credit card details for the payment. (please be aware, if any customs duties are required, the receiving party must bear this cost). Get 1 bottle by buying 5 bottles. One shipment can contain up to 6 items. Copyright 2018 VERDAD Incorporated. All rights reserved.